As you know, keeping proper identification on your pets is an important aspect of responsible ownership - so why not do it in style? 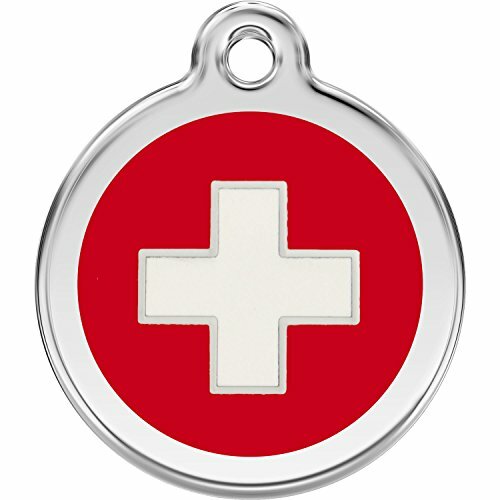 Red Dingo's Premium stainless steel and enamel IDs are the best quality pet tags available. They boast solid stainless steel construction, are hypoallergenic, twice the thickness of competitors' tags, and have highly polished surfaces with rounded edges that are gentle on your pet's fur. Best of all, they look great and the tags are guaranteed to be readable for life. Available in Small (0.75 inches), Medium (1.25 inches), or Large (1.5 inches). Shipped with a split ring to attach to your pet's collar. Please note: custom engraved items are not returnable or exchangeable for any reason. Red Dingo pet ids are shipped by USPS First-Class mail in a small white envelope. Please ensure the shipping address receives regular postal mail. When shipping to a business, please include the business name in the address. Red Dingo ~ Stainless Steel with Enamel Dog, Cat, Pet I.D. 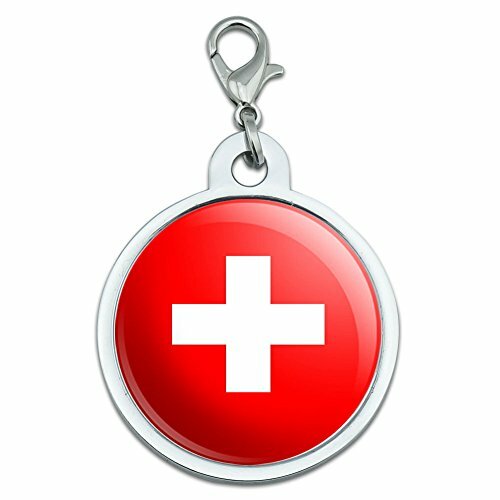 Tag - Swiss Cross (USPS Shipping W/ Tracking) (Large - 1.5"
Our gorgeous Dog, cat ID Tags are made with stainless steel and durable enamel. When it comes to dog, cat tags, your pet deserves the best. Each tag is polished and hand buffed and comes with a lifetime warranty that includes free replacement for engraving wearing out. Instructions for engraving: Upon checking out, you will have an opportunity to submit engraving information. Small tags - three lines of engraving with 12 characters including spaces on each line. Medium tags - five lines of engraving with 16 characters including space per line. Large tags - five lines of engraving with 19 characters including space per line. Please note: custom engraved items are not returnable or exchangeable for any reason. Enhance your pet's collar with this one-of-a-kind pet tag! The tag is chrome plated metal with the UV resistant resin coated design shown. The tag is approximately 0.88" (22mm) in diameter. Can be easily attached to collars with the included lobster clasp. Our gorgeous dog ID tags are made with solid stainless steel with enamel. These tags are twice as thick as most dog tags on the market. When it comes to dog tags, your pet deserves the best. Each tag is polished and hand buffed and comes with a lifetime warranty that includes free replacement for engraving wearing out. Once you purchase the tag, you will receive an email asking you for the engraving content. If you don't receive an email check your spam and/or contact us. Once we receive your engraving instructions, your tag will ship within 48 hours. If you want to expedite the process, please send us an email with your engraving information after you purchase the tag. Instructions for engraving: Small tags - three lines of engraving with 12 characters including spaces on each line. Medium tags - five lines of engraving with 16 characters including space per line. Large tags - five lines of engraving with 19 characters including space per line. 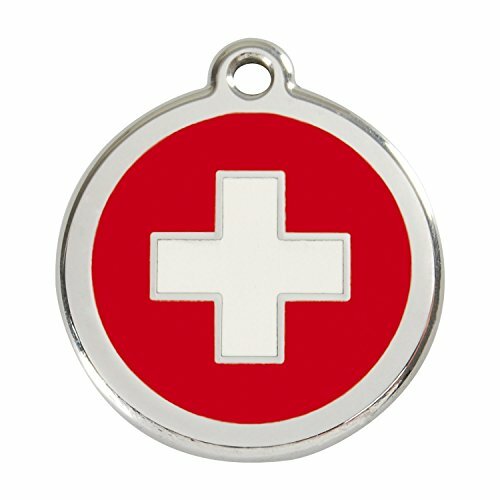 Our gorgeous Dog ID Tags are made of stainless steel and durable enamel. When it comes to dog tags, your pet deserves the best. Trust us, these tags are polished and hand buffed - they are truly beautiful. Plus, should you wish to have this engraved, engraving is absolutely free (but not required). If you would like to have this item engraved, simply place your order and contact us as soon as possible for engraving requirements and restrictions. If engraving instructions are not received, your order will ship as pictured (without engraving). This upscale dog tag also comes with a stainless steel ring for quick, easy attachment to your dog's collar. Fashionable and safe. The perfect combination. Small - 3/4", 3 lines of engraving with 12 characters per line. Medium - 1 1/4", 4 lines of engraving with 16 characters per line. Large - 1 1/2", 5 lines of engraving with 16 characters per line. Please note: custom engraved items are not returnable or exchangeable for any reason. Enhance your pet's collar with this one-of-a-kind pet tag! The tag is chrome plated metal with the UV resistant resin coated design shown. The tag is approximately 1.2" (30mm) in diameter. Can be easily attached to collars with the included lobster clasp. 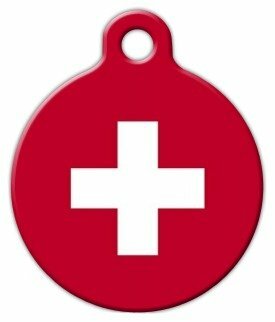 1 x Soild Stainless Steel Pet ID Tag - SIZE: L / 1.5 in Dia. 1 x Steel Split-ring Walk into the park and make an impression with a designer pet tag with a colorful enamel inlay. Includes a heavy-duty steel split ring. Guaranteed never to rust or corrode. FREE personalized engraving on the back of tag. The size of your tag affects the number of lines and characters that can be engraved on the back of the tag. SMALL - 3 lines / 12 characters per line* MEDIUM - 5 lines / 16 characters per line* LARGE - 6 lines / 19 characters per line* * Including spaces Your tag will be engraved with the information you have requested and dispatched by standard mail within 24 hours Monday to Friday. To submit engraving instructions, click on the CUSTOMIZE NOW button. The customization preview will give an approximate idea of how your engraving will appear. Your engraving will be automatically centered and resized to fit the tag. We may change the layout of the engraving if we feel we can improve the legibility of the text. 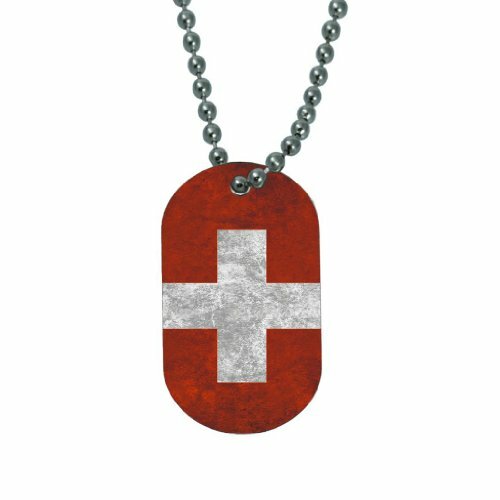 Looking for more Swiss Tag similar ideas? Try to explore these searches: Faceted Rose Quartz Bracelet, Mint Flavor Lozenges, and 2 Arm Chairs 1 Sideboard. 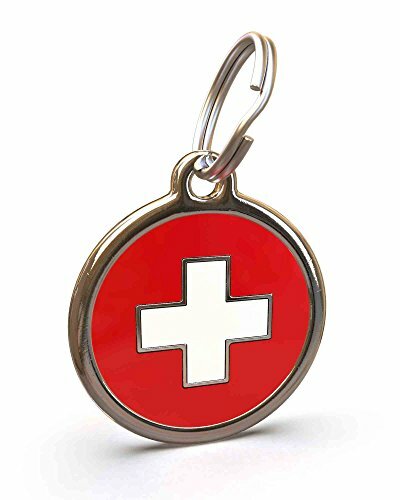 Look at latest related video about Swiss Tag. Shopwizion.com is the smartest way for online shopping: compare prices of leading online shops for best deals around the web. 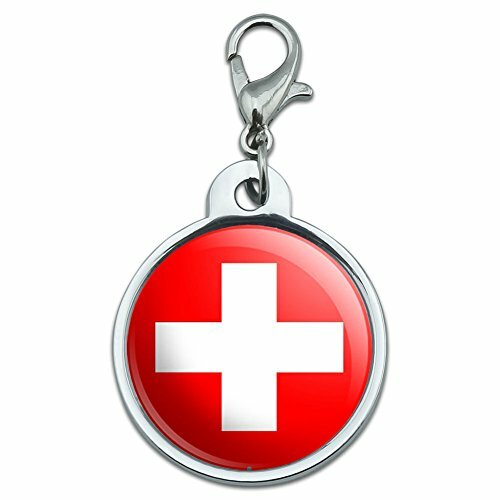 Don't miss TOP Swiss Tag deals, updated daily.